This is a rough outdoor track using Citiblock Soft tires. 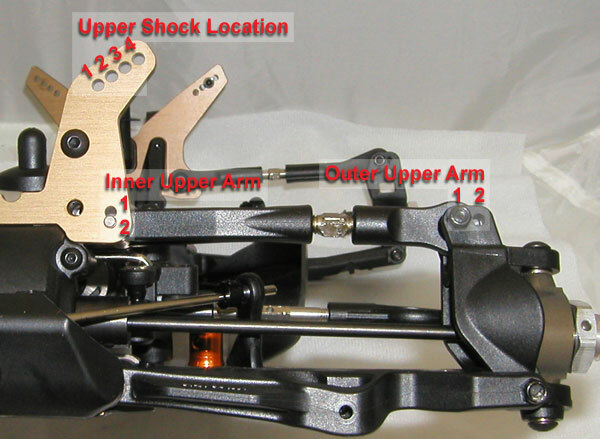 Start at the #3 position with gray spring (17mm shocks). For more steering, move location in, for less move out. Upper inner arm location #1 (for less steering use location #2). Short Ackerman Bar (for more steering use the medium). Stock caster is 20 degrees total. 2.4mm bar (for more steering use 2.2mm bar). Stock piston hole is 1.5mm. Set preload so that front arms are level to ground. 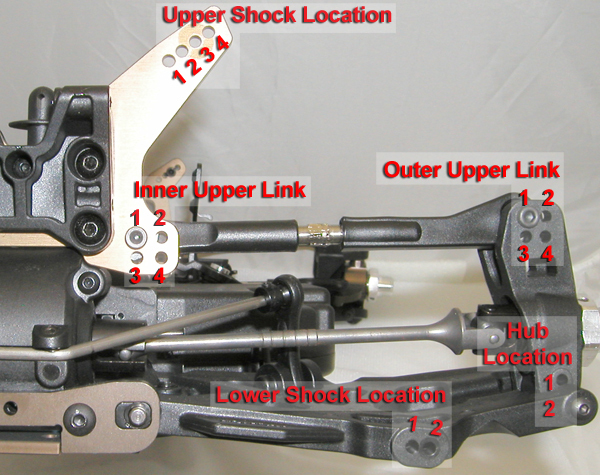 #3 position with gray springs (17mm shocks). For more steering, move location out, for less move in. Location #1 (location 2 will give more steering, but will traction roll). Set preload so that dog bones are level to ground. 2 degree (#2). If rear of buggy is hopping on acceleration, use 1 degree (#1) anti-squat (when using 1 deg., the buggy will have less jumping distance). Use 3 degree (#3) if you need more jumping distance on very smooth tracks (when using 3 deg., the buggy will be very choppy in rough sections and we rarely ever use it). 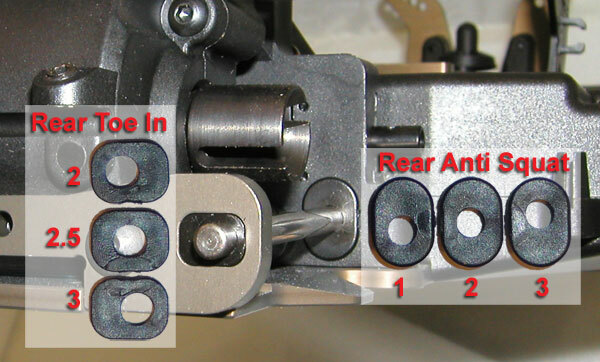 3 degree (less rear toe-in will allow the buggy to rotate more through the center of the corners). 5,000 wt - Thicker oil will increase on power steering and thinner will increase off power steering. 7,000 wt - Thicker oil will increase on power steering and decrease off power steering. Thinner will decrease on power steering and increase off power steering. 2,000 wt - Thicker oil will increase rotation out of the corner and increase straight line stability. Start with the front dog bones a little up from level and 65 mm of droop (measured from the bottom of the chassis to the table top). Start with the rear dog bones level to the table top and 65 mm of droop (measured from the bottom of the chassis to the table top). 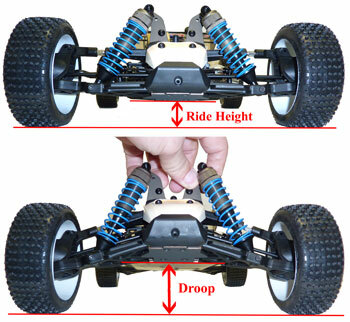 Start with 65 mm in the front and 65 mm in the rear measuring from the bottom of the chassis down to the table surface. When track conditions get rough, try limiting the droop so the tires skip across the holes instead of falling in and upsetting the handling. Copyright © 2008 NitroHouse.com. All Rights Reserved. Justin Sweatt's TLR 22SCT 2wd short course race truck. Justin Sweatt's TLR 22T 1/10 scale race truck. David Munsey's 1/8 scale electric Tekno EB-48. David Munsey's Hyper 9e 1/8 scale electric buggy. Help promote NitroHouse and the hobby and help you with extra discounts.